The Baby Jogger saves the day! We’ve all been there: everything was going PERFECTLY fine until Junior went boneless somewhere in the back corner of Fantasyland. And not the part that’s convenient to the train station, either. What to do? Your middle child is desperate to ride Ariel’s Grotto again and if your eldest doesn’t get to Splash Mountain soon, there’ll be MUTINY! But Junior’s not having it, and onto the pavement he flops. Do we CARRY him around the park the rest of the sweaty afternoon? Nope. Not when you’ve got THIS super swell thing at your becka and call. 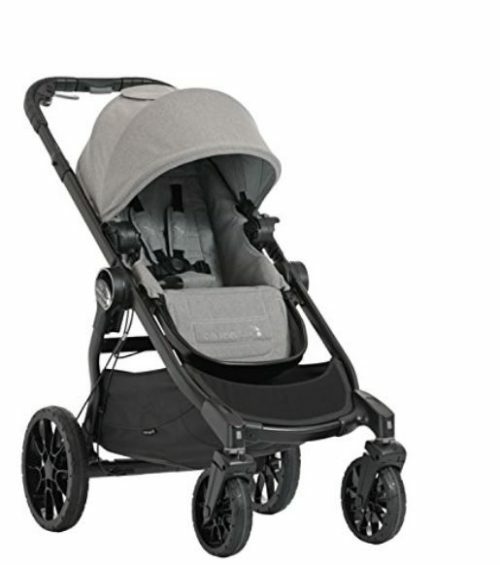 The City Select Lux Baby Jogger Stroller is the perfect thing for when the little kids crash, but the big kids are just getting their second wind. It converts from a single to a double stroller, collapses conveniently, and has all-terrain wheels for when you need to roll over sidewalks to get to the Parade on time. One point for good parenting. Check out our list of other things you need to pack for your trip to Disney! Nice! When my kids were small I always found it super important to travel with their regular stroller. It really helps them to feel comfortable and safe in the busy Parks.